I’m currently in Cambodia working with the Greater Angkor Project and recently some research by my friends/colleagues here have been in the media in a big way (links at the end). I was going to wait to post about this work until a bit later, but today I saw a post in my twitter feed that seemed to downplay the importance of this find by stating we already knew about this city. Normally, I find that the press often overstates and oversimplifies archaeological findings, but in this case I think the LiDAR findings, including those on Phnom Kulen which have been in the news, are worthy of some of the hype. The news stories have largely focused on the discovery of a “lost city” on Phnom Kulen, but this is part of a larger LiDAR survey over part of the Angkor region. LiDAR is a laser scanning technology that gives you an incredibly detailed view of the landscape, including features you can’t see under dense tree cover or that may not be clear on the ground level. LiDAR has been used before in archaeological studies, but the current project is the largest archaeological use of LiDAR to date. It is also incredibly expensive, and required the formation of a consortium to help fund and support the project (more here). Archaeologists and historians have long known that Phnom Kulen was important to the early history of the Angkorian empire. Firstly because there are some early brick temples, but also because historical texts state that the “founder” of Angkor, Jayavarman II, held his consecration ceremony at Phnom Kulen. I visited Phnom Kulen in 2008 and saw the archaeological work being done by the archaeologist J.B. Chevance and the the Phnom Kulen Program (see more here and here . The forest was quite dense, he needed to have the areas around the temples cleared for land mines, and while these historical documents had suggested a city, his comprehensive and extensive work did not clearly uncover a city or major habitation areas. But on the ground archaeology is difficult, and recent remote sensing technology has been incredibly helpful in identifying cultural features on the landscape that are difficult to see on the ground. Readers who are not archaeologists may also not understand that many archaeologists hold a healthy amount of skepticism regarding historical documents. Texts are often written years removed from when an event took place, contain the bias of the writer, and often have a broader agenda than simply stating what happened when. Historical texts provide a hypothesis to be tested with archaeological data. The goal of archaeology, generally, is notto prove that historic texts were true. If we cannot find archaeological data to support historic texts, then we begin to think more critically about them. Up until now, archaeologists had to consider that the lack of evidence for a Jayavarman II city on Phnom Kulen could indicate that historic texts were incorrect. So yes, there was an idea that Mahendraparvata existed on Phnom Kulen, but archaeologists weren’t exactly sure what the texts were describing where it was or the extent of this place. In this way, the information about Mahendraparvata was lost, and the LiDAR data really did lead to the discovery of a lost city. I’m generally a bit of pessimist, but this work is really, really, really, cool. So it’s ok, dear reader, to let yourself get swept up in the romance of archaeology. There is still so much we don’t know about Cambodia’s archaeological past and this place is deeply fascinating. But I’m not sure how many more lost cities or lost temples there are to be found here, so let’s enjoy a great archaeological discovery like this when we find one. The LiDAR data will be published later this month and at that point I hope to share more about the work I’ve been doing excavating as part of GAP in the Angkor Wat enclosure. 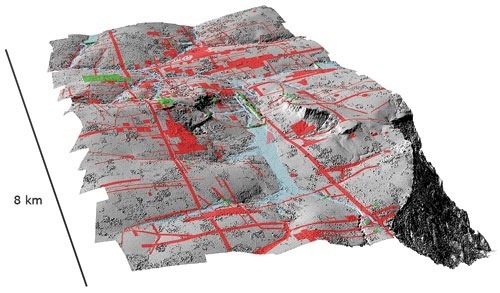 Let’s just say LiDAR data has a lot to tell us about the urban core of Angkor as well. This entry was posted in Uncategorized and tagged Archaeology in Cambodia. Bookmark the permalink. Fantastic! Thanks for writing this up! I thought the sudden “not really NEW news” piece sounded very much like a serious colleague who wanted to avoid being charged with grabbing undue credit for such a ‘discovery’ – after all, who needs another Mouhout?! I’m really glad to read this explanation of the methods and challenges. Yay for public archaeology! Looking forward to reading more after your current bout of fieldwork, both about this and other stuff! I just saw J.B.s follow-up in The Cambodia Daily (in my post I was not referring to him, but another twitter user I don’t know who I thought misunderstood the data). I appreciate his sentiment 100% and largely think his excellent work at Phnom Kulen has been unfairly downplayed in the press in favor of playing up the “lost” aspect. Another memeber of his project does call the LiDAR data a “game-changer,” and what I’m discovering is that it’s hard to clearly explain these kinds of archaeological finds (i.e. data of a large urban network, the extent of which we did not clearly understand or know about) to the press without somehow compromising on previous work. I mean, in archaeology we test plausible hypotheses all the time. When we get clear data to support a hypothesis I think it is something to celebrate. Another lesson I am learning- the importance of publishing your data quickly, so you can control, in part, the message and publicity. I’m not trying to take a swipe at JB here, but the immediacy of the LiDAR data compared to years of ongoing archaeological fieldwork is something many in our field are probably unprepared for. Thanks! Is there a way to contact you or any of the team from LOMAP or GAP? Thanks Alison! Will contacts you soon. Thanks for your post Alison. As the architect of the lidar mission and the lead author of the scientific paper that’s generating the buzz, I too am very disappointed with the vast majority of the reporting on the issue, and would like to further clarify a few things here. Firstly, you would never find an archaeologist using an awful cliché like “lost city” to describe their finds, and neither myself nor my colleagues have ever made any such claims. Secondly, the article in the Cambodia Daily implying that there is/was any discord between JB and I (or any other of our co-authors) about the nature and significance of our finds is a fabrication. Basically, when it became clear by Sunday evening that the Phnom Penh Post had completely swept the floor with the Cambodia Daily on this story, we had the journalist in question from the Daily calling us looking to find whatever negative slant she could, in order to downplay the significance of the Phnom Penh Post’s story. Several of us had long (and we thought positive and productive) conversations with her, and all of us tried to provide her with some desperately-needed context and clarification to provide some balance to the media hype that had run all weekend. What the journalist in question then did was took a couple of those clarifying comments from JB completely out of context and tried to score points against the Phnom Penh Post by running some total beat-up about archaeologists arguing about the nature of the finds. “Lost city not lost after all” would have made a great headline, had we actually claimed it was a “lost city” in the first place, which we most definitely had not. In a week that brought into very sharp relief the shoddy reporting that typically surrounds archaeological discoveries, this lazy and sloppy piece of journalism in the Cambodia Daily was surely the low water mark. JB and I subsequently released a joint press release completely rejecting her claims, which can be found on the angkorlidar.org web site. The Cambodia Daily article downplaying the significance of the discoveries made an interesting counterpoint to the excellent piece which ran in the Phnom Penh Post on the same Monday, in which eminent scholarly authorities like David Chandler and Michael Coe were enthusing with quotes such as “This is the greatest advance in our knowledge of Angkor as a living city in the past century.” I don’t know how anyone could read those stories side by side and reach any conclusion other than that the Cambodia Daily piece was a hatchet job designed to distract from the simple fact that they’d completely dropped the ball on one of the biggest Angkor-related stories of the year. So, to address the main question: did we know the city was there? Well, yes and no. As Alison explained very well above, we’ve known since the late nineteenth century that there were a few temples up there, and there are Angkor-era inscriptions that describe that the capital of Jayavarman II as being somewhere up there on the mountain. Plus, JB had been working for years up there on two sites called Rong Chen, a temple-mountain, and Banteay, probably a royal palace; when you have sites like that it’s usually an indicator that there’s probably a broader urban layout. But it is one thing to have a random scatter of points on the map and a handful of notoriously unreliable ancient texts, and a completely different thing altogether to have a comprehensive urban network of roads, canals, dams, residential neighborhoods (not to mention double the number of temples) uncovered and mapped for the very first time, with exceptional clarity. Of course we suspected that we would find something, and we had clues: it’s ludicrous to imagine that you’d mount a quarter of a million dollar remote sensing mission over some random bit of forest in the hope that you might get lucky and find something by accident. But look at the figure that Alison posted above. In it, the green stuff is what we knew before lidar, and the red stuff is what we knew after. Notwithstanding the hype about “lost cities” and so on, readers can look at that image and make up their own minds about the scale and significance of the discoveries. Of course, you can send out press releases and try to explain the nuances of the scientific findings to journalists until you’re blue in the face, but I know from many years of experience with communicating archaeology to the public that if journalists want to run with a bunch of tired old clichés and personalize the story with protagonists hacking through the jungle with machetes Indiana Jones-style and finding lost cities and so on – and most journalists will – then there’s absolutely nothing you can do about it. I suppose it’s easier for them to do that than try to make sense of a dense and highly technical scientific paper, condense that into 500 words or whatever, and get their story in on a tight deadline… and of course it sells more papers besides. I should echo Alison’s sentiment that all of us are somewhat perplexed by the overwhelming attention being given to the Kulen results. In a 5000 word scientific paper, I think there are maybe like two or three sentences that deal specifically with that aspect of our findings. It actually represents somewhere between 5% and 10% of our actual lidar data coverage. Unfortunately I think the tone and the direction of much of the week’s media coverage was set in the first place by the Sydney Morning Herald, who ran a series of rather sensational pieces that have fixated peoples’ attention on the Kulen, and muddled peoples’ perceptions about the roles of the people and places involved in our program. 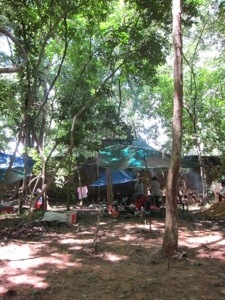 In fact, some of the most spectacular results are in the forests around Angkor itself. There, as with the Kulen, we uncovered and mapped previously obscured or hidden urban landscapes that we sort of expected to find, but we also found loads of things that have taken us completely by surprise and have already set in motion a major re-think about the historical development of the city of Angkor. Thankfully a journalist with integrity, Michelle Vachon, has redeemed the Cambodia Daily by penning a very sober, thoughtful and balanced follow-up on the lidar work at Angkor that got a full-colour spread today, and hopefully will end up online. A final note here about the fact that the Sydney Morning Herald mentioned that several of the newly-documented temple sites were ‘unlooted’. I’ve seen a bit of ill-informed criticism of this online, so I just want to address the issue. Firstly, let’s be clear that looters are far better at finding temples than archeologists are, which is why the vast majority, if not all, of the many thousands of temples discovered across Cambodia in recent years have been looted already. The (very few) temples that we’re finding with lidar that are unlooted can’t be seen on the ground. They are buried beneath the ground and covered with dense vegetation in well–protected forest areas e.g. in the Angkor Park, and the lidar instrument is picking up traces of the spatial patterning in the topography of the landscape – bumps and depressions of only a few centimeters that indicate where buildings once stood or moats were dug and so on. These are basically completely unnoticeable on the ground, and it’s only possible to make sense of the spatial patterning and recognize it as a temple from the air – and even then, only if you have a lidar instrument. So, it is impossible for these sites to be looted unless we publish the coordinates, which of course we will never do. The thing is, we specifically asked the Sydney Morning Herald NOT to publish the fact that the temples were unlooted, not because they are in any danger of being looted (they are not), but because we knew it would cause consternation among people who don’t fully understand the situation. They did not comply with our request, but this has absolutely no negative implications for the safeguarding of the temples in question, although I can certainly see why people thought that it might have been irresponsible of them to print this. Anyway, this has turned out rather long, but I hope it helps to make sense of a few things that have been misunderstood. Thanks for your comments Damian. I think this is important stuff, so I’m going to give it a bump and its own post. Yes I seen a few articles and it did seem a little out there. But thanks to your and other hard work, this city is now on the world map. It is no longer just a fable tale on someone lips or just a description on a stone inscription. Anyway keep up the good work Damain. Thanks for these clarification Damian, and for your post Alison. As the ADF team leader, you can imagine the discovery of the “lost city” was a .. discovery for us! Quite unusual to learn from the press you have discover something you have been working on for years. It all depend on what you talk about but journalists have a terrible tendency to summarise, cut and sell cliche and if you do not control the info (which is very difficult of course), they take over the facts. As you know and precisely because of the natures of the features as well as the characteristic of the Kulen sites (forest cover, topography…) we were very surprised with such a urban system up in the plateau. That is precisely the major advantage of a great tool such as the lidar in this environment. However, the cliche of a “lost city” is unbearable. From inscriptions to temples, royal palace, massive hydraulic features, dikes and others features, all pointed out that there was a city up there…Years of work completely denied in these 2 words. I am sure you can understand, as archaeologists excavating, researching, leading team, looking for funds (among them the one who paid the Lidar in Kulen, allowing us to join the Kalc consortium,set up by Damian), dealing with donors, local and international institutions… my feeling about this. I am not trying to deny (I would be crazy!) this discovery, i am just trying to put things back into their context, which is what we have been doing with Damian for the last 10 days. you just can not say “there was an idea that Mahendraparvata existed on Phnom Kulen, but archaeologists weren’t exactly sure what the texts were describing where it was or the extent of this place”. You do not come across a mountain temple (2009 campaign), a very probable royal palace (2009, 2010, 2012 campaigns), dozens of temples (6 campaigns from 2008 to 2010) in a provincial site. It became more obvious, thanks to our research, that the capital was there. We could also see some spatial organisation between the main sites (cf. my PhD, dec.2011), the beginning of an urban system. But of course, the city as a urban organisation comprising all these unknown features was the main discovery. It give us now the big picture, at least a window open on a very important urban system, extremely organised in an chaotic topographical environment. The mapping of these feature is the real discovery so I think we all agree on the fact that it all depend on what we talk about. Therefore, playing with words could last forever if people, and specially medias, do not know what they talk about. As you said Alison, there is a difference between ground archaeology in this environment and remote sensing archaeology. You just don’t get the same kind of datas and the same results. Nevertheless these two should add together instead of being completely opposed or/and denied. It would be rejecting & denying all the works done by previous researchers, myself since 2003 and ADF since 2008. I also agree with your sentiment on the fact that too much attention was given to Kulen, putting the other results on Angkor and Koh Ker in the shade. I am now just asking, who brought them to Kulen? Why they did not talk about the other results? The moral of this media buzz story and a bit of advise for all my colleagues: publish as soon as you can and select the journalist you want to communicate with, be extremely careful on how journalist can interpreted the information you give/show them! One last example: talking to Michelle Vachon with Damian last week for the Cambodia Daily, in that spirit of balancing the discoveries and putting things back into their context of research: just showing her the lidar image of Banteay convinced her that we found the royal palace with the lidar. It is (very roughly) on Boulbet’s map, 1979, we had 3 campaigns (exca + topo) on this site and I spend hours ground surveying it and organising demining operations…even if I told her that! Thanks for responding JB and for the clarifications regarding your work on Kulen. I was not aware of even some of the more recent on the ground work you have done, so I look forward to hearing more about it!